South Suffolk MP James Cartlidge, Sudbury Town Mayor Cllr. Sue Ayers and the Deputy Mayor Cllr. Sarah Page, together with Babergh Councillors Jan and Adrian Osborne, Newton Green Golf Club’s Mens Captain Lee Prentice and Ruth and Phil Worsley from the Sudbury Area Cancer Support Group were among nearly 40 guests, volunteers and staff present at the Kernos Centre’s 13th AGM on Friday 27th January to hear about the vital work the Kernos Centre continues to do in counselling local people suffering with emotional and psychological problems. 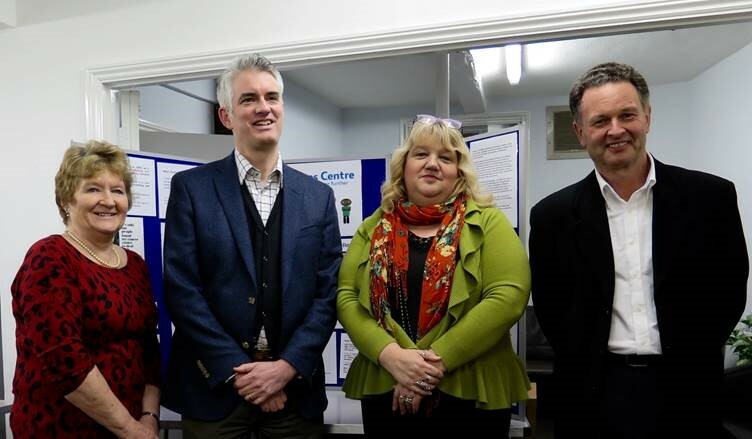 Kernos Chairman Graham Hill, on behalf of the Board, thanked everyone attending the event at the Christopher Centre in Sudbury for their interest and support, especially James Cartlidge MP for endorsing the Centre’s successful bid for a grant from the Children and Young People’s Emotional Health and Well-Being Fund and Cllr. Ayers for choosing Kernos as one of the Mayor’s charities to be supported during her term of office. Suffolk County Council – through the Suffolk Community Foundation – Babergh District Council and Sudbury Town Council were also thanked for their continuing donations and grants. These have been instrumental in enabling Kernos to support over 2,700 clients – aged from 6 to 93 – since its opening in March 2003. After listening to Counsellors Sara Jackson and Maria Currie present a couple of anonymised case study examples of the therapy the Centre undertakes with both Adults and Children & Young People, Babergh’s Cllr. Jan Osborne said: “Hearing about the good work achieved by Kernos moves me almost to tears”. Lee Prentice and Ruth Worsley also voiced their reasons for supporting the Centre: Lee stated that the Golf Club chose Kernos as their charity partner because it is independent, local to the community, meets a community need, and delivers a service that members of the Club can relate to; Ruth said that it was very inspiring to hear about the good work done by Kernos and that those Sudbury Area Cancer Support Group members who had received treatment at the Centre had benefitted enormously – she wrote afterwards:“…the people of Sudbury are so lucky to have Kernos”. Attending the AGM: from left to right – Mayor Cllr. Sue Ayres, James Cartlidge MP and Deputy Mayor Cllr. Sarah Page with Kernos Chairman Graham Hill.